Please find attached the Agenda’s for the AGM and the next General Committee Meeting which will both be held on Sunday 14th April 2019 at The WI Hall, Mill House, Mill Yard, Southam Road, Dunchurch, Rugby CV22 6NW. This entry was posted in Association on 30th March 2019 by Chris Charles. The Minutes for the January 2019 A7CA Meeting are now available download. This entry was posted in News on 10th February 2019 by Chris Charles. Please download the agenda for the next Austin Seven Clubs’ Association meeting which will take place on Sunday 20th January at 11am at the WI Hall, Mill House, Mill Yard, Southam Road, Dunchurch,, Rugby, CV22 6NW. This entry was posted in News on 8th January 2019 by Chris Charles. The minutes from the October 2018 meeting are now available to download. This entry was posted in News on 29th October 2018 by Chris Charles. 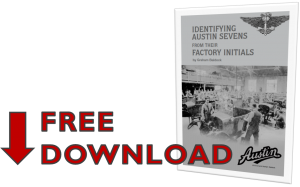 The Identifying Austin Seven Booklet produced in 2012 is now available to download via our website. Many Thanks to Graham Baldock for producing this booklet. This entry was posted in News on 30th August 2018 by Chris Charles. The minutes for the postponed July 2018 meeting are now available to download. This entry was posted in News on 16th August 2018 by Chris Charles. It is great to be able to report that the Historic formula is undergoing a remarkable upturn in numbers this season with both Mallory and Cadwell having capacity grids. A large part of this is the number of ‘new’ Austin 7 cars competing for the first time, including drivers who are making long journeys from the Continent to compete as the word gets around via Facebook etc. A wet Cadwell last weekend saw some particularly exciting A7 racing with 8 Austins out of 24 formula cars lining up. 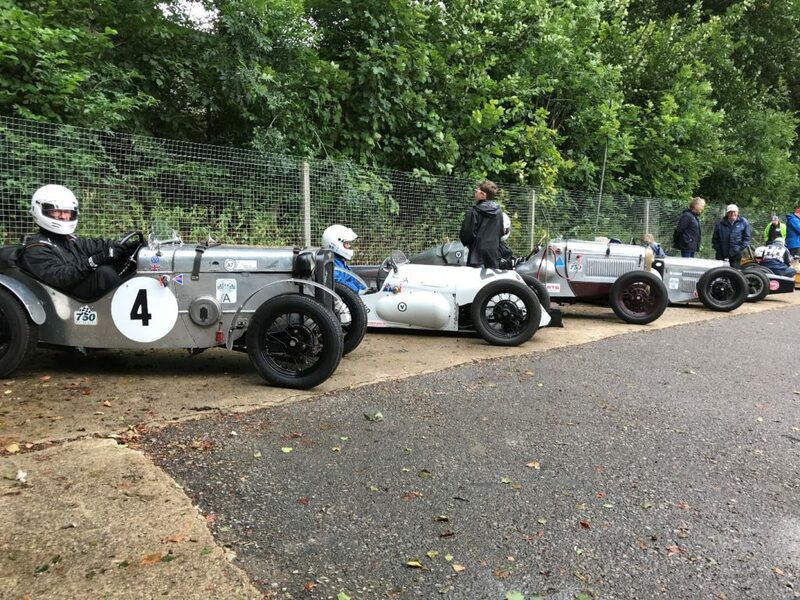 The VSCC (with a little encouragement) has challenged the Historic 750 Formula to take part in an All Austin 7 Race at Mallory Park next Saturday 11th August. This will be the first time that such an event has been attempted in many years and the response has been marvellous with another full grid of 24 cars and reserves booked in. There will be a full day the usual VSCC race action as well so why not bring your Austin 7 along to watch and enjoy the fun? Discounted tickets are available for ‘750MC Members’ so email cplainjonesaustin7@gmail.com if you can make it. This entry was posted in News on 7th August 2018 by Chris Charles. We are delighted to welcome Paul Lawrence as our new Secretary. Paul is currently Secretary of the Cambridge Austin Seven Club and well known in Seven circles being a keen enthusiast with his much travelled Ruby and his RN saloon. Recently retired, Paul has started a new career in servicing and restoring Sevens. We look forward to working with Steve and can assure him of all the support he requires in this important post.